Decreased Effective Blood Volume in Edematous Disorders: What Does This Mean? Edematous patients with renal sodium and water retention, particularly cardiac failure and cirrhosis, have been suggested to have a decreased “effective blood volume.” This enigmatic and undefined term was coined because edematous patients were found to have increased, rather than the earlier proposed decreased, blood volumes. This article discusses the advances that have occurred in understanding the pathophysiology of edema as occurs in conditions such as cardiac failure, cirrhosis, and pregnancy. The regulatory mechanisms that lead to increased sodium and water retention by the normal kidney are related to arterial underfilling, as a result of a decrease in cardiac output, arterial vasodilation, or both. The focus then turned to a decrease in total blood volume as the potential signal for sodium and water retention in heart failure and cirrhosis. This explanation was plausible, because a decrease in blood volume (e.g., gastrointestinal hemorrhage, diarrhea) was known to be associated with renal sodium and water retention. In earlier years, this possibility actually led to volume expansion as a treatment for the edematous patient with heart failure or cirrhosis. Surprising, however, when accurate measurements became available to assess total blood volume in patients with heart failure or cirrhosis, a decrease in blood volume was not found. In fact, blood volume was frequently increased in patients with heart failure and cirrhosis. The afferent signal for renal sodium and water retention in edematous disorders continued to be perplexing. A term, therefore, emerged and became ensconced in the clinical vocabulary; specifically, sodium and water retention in edematous disorders was proposed to be due to a decrease in “effective blood volume” rather than total blood volume.5 For many years, however, this enigmatic term, which was used to explain sodium and water retention in patients with heart failure or cirrhosis, was never defined. Cardiac output was initially proposed by Borst et al.6 as the mediator of the “effective blood volume.” This possibility was attractive, because a diminished cardiac output was a frequent finding in edematous patients with cardiac failure. However, if the normal kidney is uniformly responding to a decrease in cardiac output in edematous disorders, then a problem arises because sodium and water retention occurs in patients with cirrhosis, high-output cardiac failure, and normal pregnancy in the presence of an increase in cardiac output. On this background, a unifying hypothesis for renal sodium and water retention that addressed most of these dilemmas was proposed.3,4,7,8 Estimates of blood volume distribution indicate that 85% of blood circulates on the low-pressure, venous side of the circulation, whereas an estimated 15% of blood is circulating in the high-pressure, arterial circulation. Thus, an increase in total blood volume could occur, even as there is an underfilling of the arterial circulation, if the increase in total blood volume is primarily due to expansion of the venous compartment. Underfilling of the arterial circulation could occur secondary either to a decrease in cardiac output, as occurs in low-output cardiac failure, or to systemic arterial vasodilation, which occurs early in cirrhosis as a result of diminished vascular resistance in the splanchnic circulation.9,10 With this hypothesis, the events that are triggered by arterial underfilling, as a result of either a decrease in cardiac output (Figure 1A) or systemic arterial vasodilation (Figure 1B), are compensatory responses to restore arterial circulatory integrity. Because adequate arterial perfusion of vital organs is mandatory for survival, a mechanism for body fluid volume regulation by the kidney that focuses on the absolute (cardiac output) or relative (arterial vasodilation) fullness of the arterial circulation is attractive from a teleologic point of view. Clinical conditions in which a decrease in cardiac output (A) and systemic arterial vasodilation (B) causes arterial underfilling with resultant neurohumoral activation and renal sodium and water retention. In addition to activating the neurohumoral axis, adrenergic stimulation causes renal vasoconstriction and enhances sodium and fluid transport by the proximal tubule epithelium. Reprinted from Schrier,7 with permission. 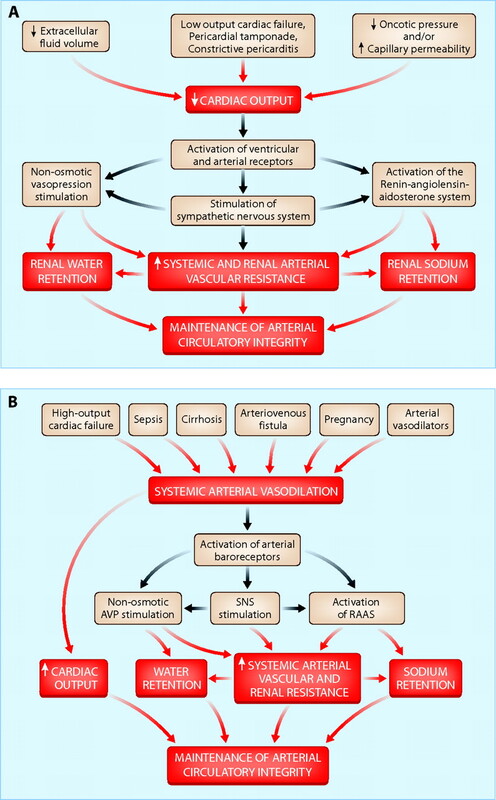 With the primacy of the integrity of the arterial circulation in renal sodium and water regulation, sensitive arterial receptors that respond to arterial underfilling must exist. In this regard, there are sensitive stretch receptors in the carotid artery, aortic arch, and the glomerular afferent arteriole that respond to a decrease in arterial pressure. Because of the importance of arterial perfusion, the compensatory responses to arterial under-filling occur rapidly. With arterial underfilling, as a result of a decrease in cardiac output, arterial vasodilation, or both, a decrease in glossopharyngeal and vagal tone from the carotid and aortic receptors leads to a rapid increase in sympathetic activity with associated activation of the RAAS and nonosmotic release of vasopressin. The resultant increase in systemic vascular resistance and renal sodium and water retention attenuates the arterial underfilling and associated diminished arterial perfusion. There are low-pressure receptors in the cardiac atria that suppress vasopressin release, decrease renal vascular resistance, and increase sodium and water excretion in response to an increased transmural atrial pressure.15 In cardiac failure, however, atrial pressure rises, yet sodium and water retention occurs. This suggests that activation of the arterial stretch receptors in cardiac failure predominate over any atrial pressure receptor reflex in cardiac failure. An increase in the ventricular synthesis of brain natriuretic hormone (BNP) and thus circulatory BNP concentrations also occurs in cardiac failure and may attenuate the degree of renal sodium and water retention.16 BNP may decrease the edema formation in cardiac failure by both suppressing the RAAS and inhibiting tubular sodium reabsorption. Of further interest is the renal sodium and water retention that occurs with diastolic dysfunction in the presence of normal cardiac output, as assessed by ejection fraction.17 Although a decrease in stroke volume and diminished arterial pressure have been shown to release the tonic inhibition from the carotid and aortic baroreceptors on the sympathetic outflow from the central nervous system, this should not be a reflex pathway for sodium and water retention in patients with diastolic dysfunction and a normal cardiac output. There are, however, ventricular receptors that may be involved with sodium and water retention in patients with diastolic dysfunction.18 Similar reflexes may be involved in right ventricular failure that occurs with pulmonary hypertension in association with renal sodium and water retention. This possibility, however, is in need of investigation. Monitoring arterial underfilling in edematous patients by measuring the hormones that are associated with activation of the neurohumoral axis is obviously neither timely nor cost-effective in the clinical setting. However, in edematous patients who are on a normal sodium intake and in the absence of diuretics, a low fractional excretion of sodium indicates clinically important arterial underfilling and should initiate a search for an associated decrease in cardiac output and/or systemic arterial vasodilation, which are potentially reversible. The author's research cited in this article was supported by National Institutes of Health grant P01 DK19928 and General Clinical Research Center grant M01 RR000051. The assistance of Jan Darling in preparation of the manuscript is appreciated. You are going to email the following Decreased Effective Blood Volume in Edematous Disorders: What Does This Mean? Sodium Retention in Heart Failure and Cirrhosis: Potential Role of Natriuretic Doses of Mineralocorticoid Antagonist? Pulmonary Hypertension, Right Ventricular Failure, and Kidney: Different from Left Ventricular Failure?